If you are a Pig Lover and a lover of games then Grab a Pig is sure to please you. 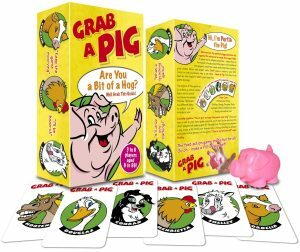 Grab a Pig card game includes five adorably cute soft plastic pigs. The pigs have been made from our very own especially designed mould; and they are entirely unique. Grab a Pig is about more than just the pigs however, it is a riotously funny pig game that will be bound to have you roaring with laughter. When we created Grab a Pig we wanted to create a game that families would play together. We wanted it to be easy to learn and fun to play, to offer a break from the TV and computers. Customers so often tell us the amount of fun they get from the game. Whether you are an adult or a child, Grab a Pig could be for you. Pig lovers will love the game too. We gave a lot of thought to the pigs; we wanted them to be cute, light and tactile; people tell us we have achieved that. They are made from more expensive plastic in order to meet our requirements. 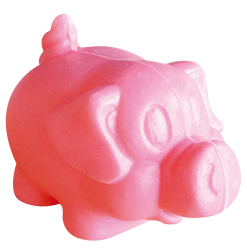 You are sure to like Grab a Pig whether you are a pig lover, a collector of pig related items, or you just love to have fun with your friends and family. The Grab a Pig game should keep you laughing however many generations play together.